Gas springs are manufactured from several components. The tubes are manufactured from pressure vessel steel with very high demands on inside surface smoothness. 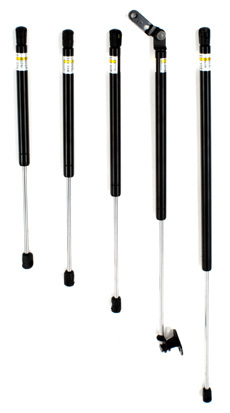 Piston rods are manufactured from finely ground and polished steel bars. The rod surface is either chrome plated or nitro-carburized to ensure high hardness, highest corrosion resistance and best possible wear resistance. Rod guides and gaskets are made from special, wear resistant materials. After assembly, the spring cylinders are painted with a paint containing corrosion inhibitors for high resistance against corrosion. The gas spring is then filled with Nitrogen gas using a technique which assures high pressure accuracy. The springs are load, deflection and speed tested before delivery and each spring is marked with an identification and part number. Below is a video of gas spring production at Lesjöfors Springs.